"KARI" redirects here. For uses of Kari, see Kari (disambiguation). The Korea Aerospace Research Institute (KARI) established in 1989, is the aeronautics and space agency of Republic of Korea(South Korea). Its main laboratories are located in Daejeon, in the Daedeok Science Town. KARI's vision is to continue building upon indigenous launch capabilities, strengthen national safety and public service, industrialize satellite information and applications technology, explore the moon, and develop environmentally-friendly and highly-efficient cutting-edge aircraft and core aerospace technology. Current projects include the KSLV-2 launcher. Past projects include the 1999 Arirang-1 satellite. The agency was founded in 1989. Prior to South Korea's entry into the IAE in 1992, it focused primarily on aerospace technology. KARI began on October 10, 1989 as a national aerospace research institute with the purpose of contributing to sound development of the national economy and enhancement of people's lives through a new exploration, technological advancement, development, and dissemination in the field of aerospace science and technology. KARI began in 1989 to develop its own rockets. It produced the KSR-I and KSR-II, one and two-stage rockets in the early 1990s. In December 1997 it began development of a LOX/kerosene rocket engine. KARI wished to develop satellite launch capability. A test launch of the KSR-III took place in 2002. Actual-sized replica of KSLV-1 Naro at public exhibition area of Naro Space Center. KARI is also developing Unmanned Aerial Vehicles, high-altitude airships, a next-generation multi-purpose helicopter project, next- generation medium satellite, and a lunar exploration project. In addition, several satellites, including the KOMPSAT (also known as Arirang) Series, the COMS (Communication, Ocean and Meteorological Satellite), and the STSAT (Science and Technology Satellite), are developed, operated, or under development by KARI. On January 30, 2013, they launched a satellite into space from their own soil for the first time. KSLV-1 launched on August 25, 2009. It was originally a cluster indigenous liquid KSR-III rockets with a solid propellant to form a multistage launcher. However, KARI experienced more difficulties than expected in SLV development, because it required much stronger propellant power than KSR-III possessed to launch a satellite into orbit. After several failed attempts, KARI turned to Russia's Khrunichev Design Bureau for assistance in developing a liquid-propellant rocket engine for the KSLV-1 as well as for cooperation in the construction of the launch facility at the Naro Space Center. KSLV-1 was transformed into a two-stage launcher, 33 m high with a maximum diameter of 2.9 m. It has a mass of 140 tons at lift-off. The first stage of the launcher was derived from the Russian URM-1 (Universal Rocket Module) developed by Khrunichev. The second stage of the launcher was a solid Kick Motor developed by Korea, which includes the Inertial Navigation System; the power, control, and flight safety systems; plus the nose fairing. KSLV-1 was the most prominent project of the whole South Korean space development program and was successfully launched in late January 2013. 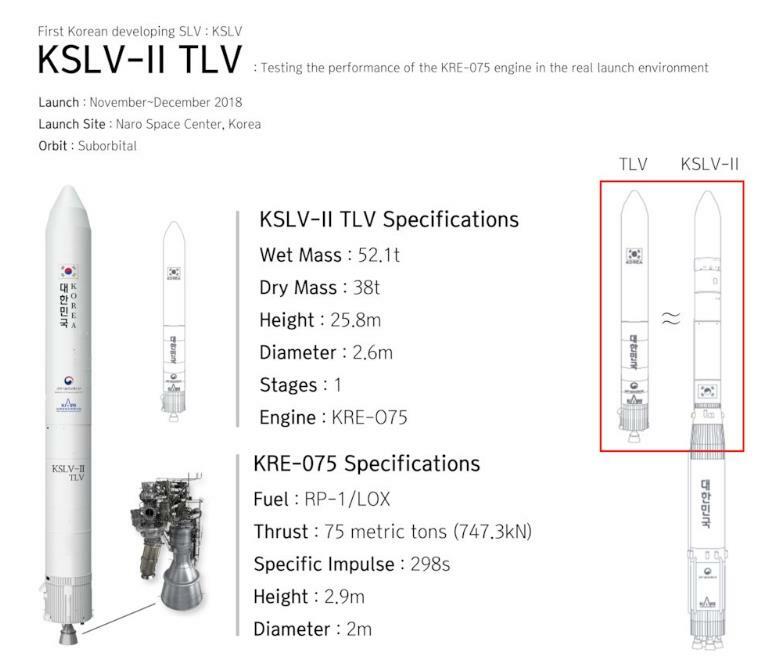 South Korea is planning to launch its next rocket KSLV-2 by year 2019. 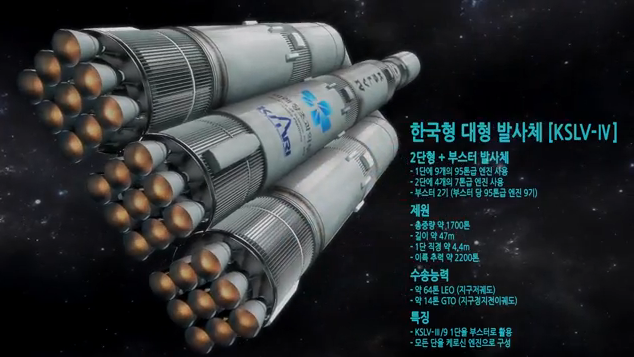 The first stage of its rocket will have 4 clustered engines, each of which will have a 75 metric ton thrust. It was announced that KARI has already developed few prototypes of a 75 metric ton thrust engine. The first TLV was launched from the Naro Space Center in Goheung, South Jeolla Province. The main objective of the first suborbital flight was for the single-stage rocket's main engine to burn 140 seconds, reaching a 100 km altitude before splashing down in the sea between Jeju Island and Okinawa Island. The maiden flight was first delayed from October 25, 2018, for two months, due to abnormal readings detected in the rocket propellant pressurization system. The test flight was then rescheduled for November 28, 2018, at 16:00 KST(UTC+9). No payload is to be placed into orbit. The launch of the first TLV while deemed successful with its main engine burning for 151 seconds in a 10 minute flight, was not broadcast live. After reaching a maximum suborbital altitude of 209 kilometers, the rocket stage hit the ocean 429 kilometers southeast of Jeju. KSLV-3 was initially designed to launch geostationary satellites of 6 tons, and to enter service in 2023. Due to the development of the Small launch vehicle (SSLV), KSLV-III is changed to GEO-SLV, whith a payload of 3t to GEO. The core stage will powered by four KRE-90 engines of 90 tons thrust, plus four liquid boosters each with a KRE-90 engine. The second stage will be powered by a KRE-90V staged combustion cycle engine. KRE-010V, the Korean staged combustion cycle engine of 10 tons thrust had a 100 second burn test on December 6th, 2018. 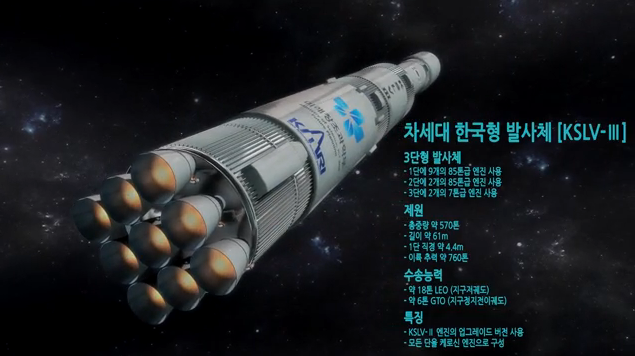 It will be used as the upper stage (3rd stage) engine of KSLV-III. KSLV-4 was expected to carry the 64-tons class space station's modules. KSLV-4 scheduled to enter service in 2028 (updated plan). Due to the development of the Small launch vehicle (SSLV), KSLV-IV will be no longer be developed. By 2025 it should be able to put a payload of less than 500kg to LEO. On November 12, 2018, the South Korean government was discussing with its American counterparts, on its plan to develop solid-fuel space vehicles, and comparable to the Japanese Epsilon rocket in performance. In December 2016, KARI signed a lunar exploration technical cooperation with NASA which increased the possibility of exploration success greatly. The Korean Lunar Exploration Program (KLEP) is divided in two phases. Phase 1 incorporates the launch and operation of a lunar orbiter called Korea Pathfinder Lunar Orbiter (KPLO), which will be the first lunar probe by South Korea, meant to develop and enhance South Korea's technological capabilities, as well as map natural resources from orbit. Phase 2 will include a lunar obiter, a lunar lander, and a rover to be launched together on a KSLV-II South Korean rocket from the Naro Space Center, in 2025. KASS is the Korean model of satellite-based augmented systems (SBAS), a technology that is capable of reducing GPS error to less than 3m. Korea is expected to become the only seventh country in the world to own an SBAS, beginning in July 2020. This technological achievement is a prerequisite for Korea joining the G7. Korea Multiple-Purpose Satellite- 3A (KOMPSAT-3A) was launched on 25 March 2015, on a Dnepr-1 launch vehicle from the Jasny Kombarovsky site in Russia. The purpose of the KOMPSAT-3A is to enable us to take advantage of geographical information systems (GIS) in environmental, agricultural, and oceanographic sciences, and to facilitate natural hazards. The KOMPSAT-3A is equipped with two distinctive sensors, a high-resolution multi-spectral (MS) optical sensor, namely the Advanced Earth Image Sensor System-A (AEISS-A), and the Scanner Infrared Imaging System (SIIS). In late 2011, KARI unveiled its tiltrotor Unmanned Aerial Vehicle (UAV) that can fly at around 400 km/hr. ^ "기관별 경영공시 한국항공우주연구원". alio.go.kr. Archived from the original on 2016-06-24. Retrieved 2016-05-25. ^ "History". Korea Aerospace Research Institute. Retrieved 7 May 2017. ^ "South Korea launches rocket weeks after NKorea". The San Diego Union-Tribune. January 30, 2013. Retrieved 2013-02-01. ^ a b An, H. (2013). Seeking independence in space: South korea's space program (1958–2010). Quest: History Of Spaceflight, 20(2), 34–51. ^ 10 Sep 2018 (2018-09-10). "한국항공우주연구원 on Twitter: "올 10월로 다가올 #시험발사체 조립 장면 타임랩스 영상으로 만나 보시죠!… "". Twitter.com. Retrieved 2019-01-10. ^ "사진 > KARI IMAGE >". www.kari.re.kr. Retrieved 10 January 2019. ^ 김한주 (28 November 2018). "S. Korea to test launch space rocket engine". Yonhap News Agency. Retrieved 10 January 2019. ^ "S. Korea delays test launch of space rocket engine". English.yonhapnews.co.kr. 2018-10-17. Retrieved 2019-01-10. ^ 한국항공우주연구원 (13 November 2018). "11월 28일, 한국형발사체 '누리호'의 엔진시험을 위한 시험발사체 발사가 추진될 예정입니다.pic.twitter.com/9eOHhufcym". twitter.com. Retrieved 10 January 2019. ^ 김한주 (28 November 2018). "(2nd LD) Space rocket engine burn time test meets target goal". Yonhap News Agency. Retrieved 10 January 2019. ^ 한국항공우주연구원 (27 November 2018). "#시험발사체 발사 성공! 발사 모습을 영상으로 공개합니다.pic.twitter.com/lTkonvL7ax". twitter.com. Retrieved 10 January 2019. ^ 김한주 (28 November 2018). 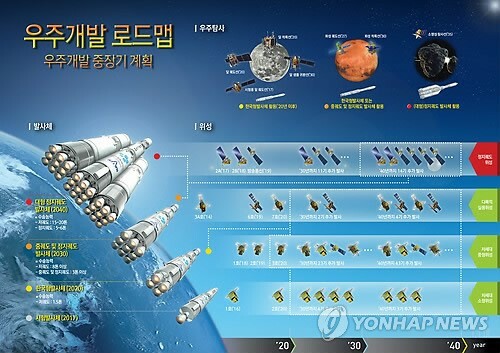 "(2nd LD) S. Korea successfully tests space rocket engine". Yonhap News Agency. Retrieved 10 January 2019. ^ News, S. Korean Spaceflight (10 December 2018). 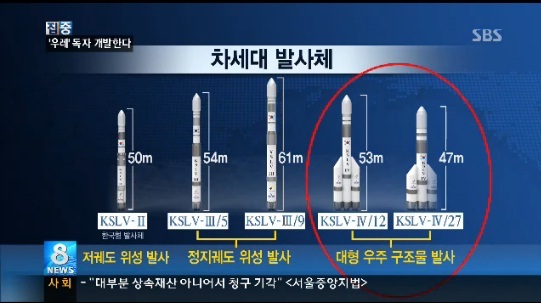 "These were the previous concepts of KSLV-III & KSLV-IV. Both were heavy launchers. However, it changed due to the development of the Small launch vehicle (SSLV). KSLV-IV will be no longer in development, and KSLV-III changed to GEO-SLV, which can carry 3t to GEO. (name TBD.)pic.twitter.com/6gy1427iih". twitter.com. Retrieved 10 January 2019. ^ News, S. Korean Spaceflight (8 December 2018). "Specification of "KRE-010V", the Korean staged combustion cycle engine which had a 100 second burn test on December 6th. It will be used as the upper stage (3rd stage) engine of KSLV-III (GEO Launch Vehicle). Rendering of KSLV-III (TBD) also included.pic.twitter.com/EDApBiriZ5". twitter.com. Retrieved 10 January 2019. ^ 이치동 (12 November 2018). "(LEAD) S. Korea in talks with U.S. over solid-fuel rocket development". Yonhap News Agency. Retrieved 10 January 2019. ^ a b Korean Lunar Exploration Program. Korean Aerospace Research Institute (KARI). Accessed on 25 January 2019. ^ KPLO. Lunar Exploration Program. Korea Aerospace Research Institute (KARI). Accessed on 25 January 2019. ^ Korean Pathfinder Lunar Orbiter (KPLO) Status Update. (PDF) Korea Aerospace Research Institute (KARI). 10 October 2017. ^ South Korea's first lunar mission planned for 2020. Emily Lakdawalla, The Planetary Society. December 7, 2017. ^ Pak, Han-pyol (1 July 2013). "핵전지 실은 한국형 로버 … 지구서 우주인터넷 통해 조종". 중앙일보. Retrieved 19 July 2013. ^ Kim, Jack (20 November 2007). "South Korea eyes moon orbiter in 2020, landing 2025". Reuters. Retrieved 25 January 2019. ^ "Satellite Navigation > R&D >". www.kari.re.kr. Retrieved 10 January 2019. ^ "KOREA AEROSPACE RESEARACH INSTITUTE". www.kari.re.kr. Retrieved 10 January 2019. This page was last edited on 11 February 2019, at 21:28 (UTC).